A bull elk was shot and 'left to waste' on Weyerhaeuser property, the Oregon State Police said. 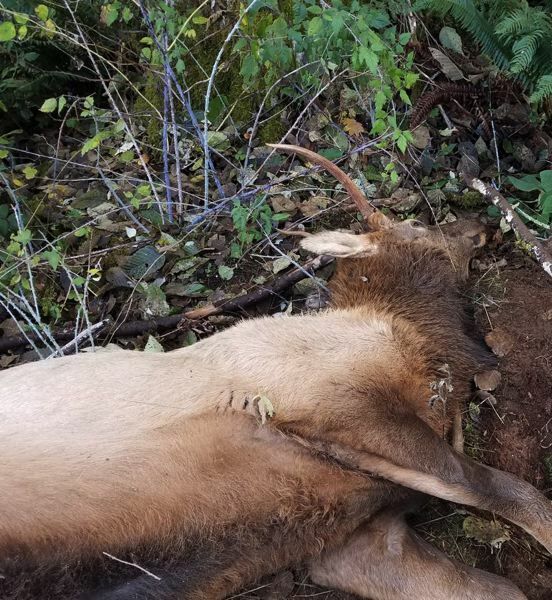 The Oregon State Police are asking for the public's assistance after two bull elk were shot and killed in rural western Washington County earlier this month. Police received information that a group of hunters had killed the elk on Saturday, Nov. 10, on Weyerhaeuser property near the banks of the Nehalem River, off of Wolf Creek and Timber roads. The hunters are believed to have been on the land without permits. One dead elk was harvested by the hunters, while the other was "left to waste," according to state police. Troopers who arrived on the scene were reportedly able to salvage most of the meat, transporting it to Hillsboro-area butcher The Meating Place for processing and donation to the Portland Rescue Mission. Troopers were unable to locate the hunters after a search. The State of Oregon offers cash rewards for information that leads to the arrest or citation for the unlawful killing, possession or waste of game animals including elk.